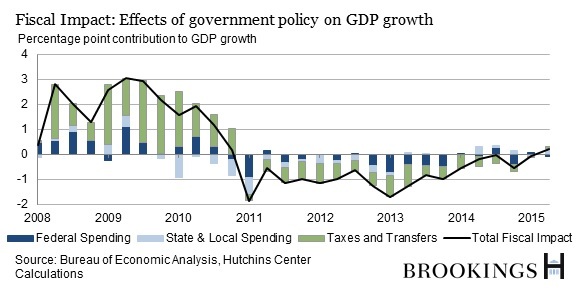 Tight fiscal policy by local, state, and federal governments held down economic growth for more than four years, but that restraint finally appears to be over, the latest reading from the Hutchins Center on Fiscal and Monetary Policy’s Fiscal Impact Measure shows. The Fiscal Impact Measure estimates the effect of federal, state and local spending and taxes on inflation-adjusted growth in the Gross Domestic Product (GDP.) As the chart below illustrates, the Fiscal Impact Measure has three major components: spending by the federal government (dark blue bars), spending by state and local governments (light blue bars), and taxes and transfers at all levels of government combined (green bars). This quarter’s data reinforce the view that the fiscal headwinds are finally behind us. Local, state, and federal fiscal policy contributed just over two-tenths of a percentage point (0.22 points) to real GDP growth in the second quarter, which came in at an annual rate of 2.3 percent. Overall, fiscal policies have been about neutral (zero) over the past year. Fiscal policy is no longer a source of contraction for the economy, but neither is it a source of strength. The recovery in state and local spending appears quite modest. Spending fell sharply in 2009 and continued to decline through mid-2013. But state and local governments still appear very cautious about hiring and investment. In the second quarter of this year, spending jumped sharply, but that followed a weak first quarter that was likely affected by weather. Over the past year, the positive contribution of state and local governments to GDP growth has averaged one-tenth of a percentage point, while GDP growth averaged 2.3 percent. Federal spending was also a source of contraction in recent years, reflecting the end of spending increases and tax breaks initiated by President Obama and Congress during the worst of the recession, as well as tight caps on annually appropriated spending and the automatic spending cuts known as sequestration. All told, federal spending lowered real GDP growth by an average of 0.35 percentage points per year between 2011 and 2013. Over the past year, real federal spending has been about unchanged, neither adding to nor subtracting from real GDP growth. Similarly, taxes and transfers at all levels of government have been a roughly neutral factor in recent quarters. The Hutchins Center’s Fiscal Impact Measure (FIM) is a gauge of the contribution of federal, state, and local fiscal policy to near-term changes in the gross domestic product, the tally of all the goods and services produced in the economy. It includes both the direct effects of government purchases as well as the more indirect effects of government taxes and government transfers. When FIM is positive, the government is contributing to real GDP growth, and when it is negative, it is subtracting from it. For more on what goes into FIM and how it’s calculated, see here. The FIM is updated after each new government estimate of GDP.